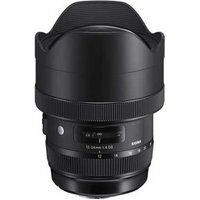 The Sigma 12-24mm f4 Art DG HSM Lens is the 3rd-generation 12-24mm lens from Sigma. With a design that guarantees outstanding image quality from the centre to the edges of images, this super-wide-angle zoom lens features lens elements made with F Low Dispersion glass to minimise distortion, chromatic aberration, and flare. Its constant f4 aperture makes it 1-stop brighter than similar lenses.